We haven't updated this index since Jan 2011, but hope to complete that activity soon! 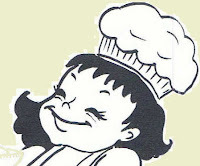 Look for our latest recipes from the archives link! Thanks for your patience! At last, our Recipe Index Page is ready! It feels like we just started the blog some days back, but we seem to have made quite a few posts already. Now you can directly find the recipe you want, instead of searching through the archives. We will keep updating this list along with our posts. We'll also be improving on our earlier posts, based on some learnings these last few months. We will look forward to your ideas on recipes to be included, and any other suggestions you may have. Thanks to you all. 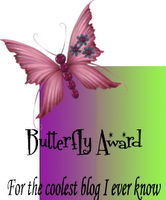 And Thanks to Yosee for her sweet illustration! 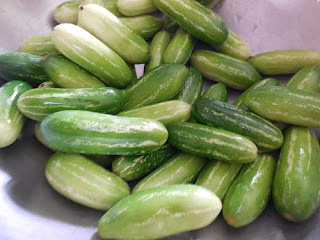 When we went to the vegetable market with father, he would carefully select all the fresh and tender vegetables. 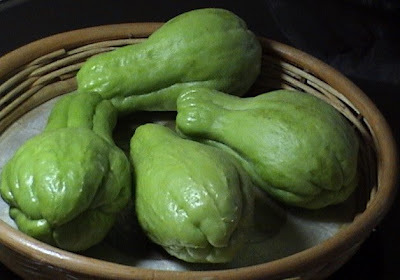 However, we made sure that we picked up at least two or three complimentary Chow Chows, which had thick rough thorny skins, to the great astonishment of the green grocer! Back home, my brother dug up holes and planted them in a row near the fence. In no time, tender shoots came up and crept all over the fence with great speed putting to shame even Jack’s Bean Stalk! Our happiness knew no bounds when the creeper was fully decked up with the tender green shiny bulb like Chow Chows. All of us loved this vegetable more because we had grown them all by ourselves. 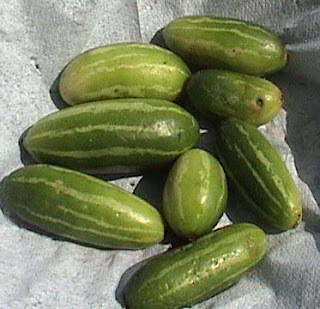 Mother used this vegetable in sambar, mor kuzhambu, koottu, mendhya kozambu or curry. She even sliced them and made hot bajjis for the evening tea. Whatever dish she prepared out of this vegetable, there would be an additional dish which came out of the peel. Thus, we named our favourite vegetable as the ‘Two-in-one Magic Vegetable! 1. Wash and scrape the peel off the chow chows, and cut them into cubes. Save the peels, and set aside for use in the secind dish. 3. When it splutters, add asafoetida and the split black gram dal. 4. When the dal turns golden in colour, add broken red chillies. 5. When the chillies turn crisp, add curry leaves and turmeric powder. 6. Add the cut Chow Chow and salt. Stir well. 7. Cover with a lid and cook in slow flame stirring now and then. 8. Chow Chow cooks in its own water. 9. When it is cooked, remove the lid and increase the heat. 10. Keep stirring till the remaining water (if any) evaporates. 11. When the curry is dry, turn off heat and garnish with fresh coconut gratings. 2. When the mustard splutters, add asafoetida and black gram dal. 3. When the dal turns golden in colour, add the red chillies. 4. Now add the chow chow peels and blend well. 5. Cover with a lid, and decrease the fire. 6. Cook until the peels become tender, and then add the tamarind. 7. Switch off flame and let it cool down. 8. When cool, grind the mixture, with salt and fresh coriander leaves, into a smooth chutney. A tasty curry and a spicy chutney is now ready from the Two-in-one magic vegetable – Chow Chow. The first sweet which comes to mind before starting any happy occasion is Theratti Pal. Be it an engagement or a wedding, a baby shower or the first birth day of a baby, or an upanayanam (thread ceremony), Theratti Pal is the first sweet to be prepared amidst great merriment. When the groom’s party arrives for the wedding, the bride’s mother welcomes them by handing over Theratti Pal to the groom’s mother. This is an age old custom. Theratti Pal plays an integral part in weaving and bonding relationships old and new. This sweet is prepared only with whole milk and sugar. Here is Theratti Pal for a happy bonding. This is sent with best wishes and many happy returns for Aparna's blog birthday. Sweet Celebrations are on at My Diverse Kitchen! 1. Choose a large wide mouthed thick bottomed wide vessel, as it should sustain boiling milk, without overflowing. 3.Once it starts boiling, reduce heat to prevent overflow, stirr and continue boiling. 4. Keep stirring frequently to prevent burning. 5. The milk will reduce considerably, and after about 30 minutes, it will become thick and slushy. 6. At this point add the sugar and continue to cook and stir. In another 15 minutes or so the the Theratti Pal leaves the sides of the vessel and come together with a coarse consistency. The sweet gets its reddish colour due to evaporation of the milk, and slight caramelising of the sugar. The whole area gets filled with aroma when stirring this sweet. The lovely flavour of full cream milk, is in itself very pleasant. Hence, the addition of saffron strands or cardamom powder is only optional. JFI :December: Carrots hosted by The Cooker! 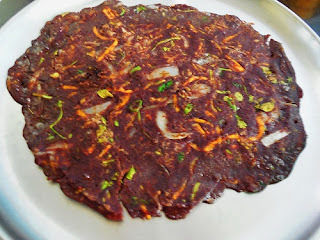 Ragi (Finger Millet) Pizza aka Ragi Rotti! Black is beautiful! Ragi dishes are always on the top of my menu list, given their nutritive qualities. Besides being a very rich source of calcium, ragi is one of the few sources of methionine for a vegetarian, especially vegan diet. Ragi known as Finger Millet or African Millet is mostly grown in arid areas in Africa and Asia, and is common in South India. Ragi Pizza is the name I use to 'sell' Ragi Rottis to my grand children, who are unbelievably ravenous when it comes to “devouring” pizzas! 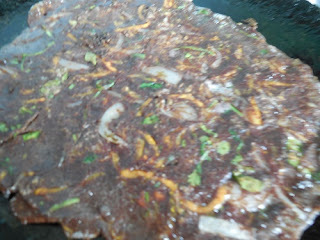 Just adding a few vegetables makes the rotti attractive and more nutritious, and a wholesome food. A ragi pizza breakfast keeps my husband going till he comes back late in the evening after finishing his 18 holes of golf. 1. Chop onions into very thin slivers. 2. Chop the cabbage similarly. 3. Mince capsicum into very thin slices. 4. Peel and grate carrot. 5. Chop green chillies, ginger and coriander leaves. 6. Mix all the cut ingredients with salt and cumin seeds. 7. Now add the ragi flour and mix again evenly. 8. Add water and make a loose dough, so that it can be easily patted on to the tava or pan. 9. Grease the tava with a spec of oil. 10. Place a ladleful of the dough on the tava. 11. Wet your fingers in cold water and then pat the dough as thin as possible into a round pizza. 12. Now turn on the flame. 13. Dribble oil around the rotti and cover with a lid. 14. Cook for 2 minutes and remove lid. 15.The ragi when cooked, will turn into a dark shade, and the vegetables will shimmer revealing their colours on top of the cooked rotti. 16. Leave the rotti on the hot tava for another minute, turn it to the other side, if you want to toast the other side as well, and then remove from flame. Hot nutritious Ragi Pizza is now ready to be served. Children will enjoy it with tomato sauce. Any pickle or chutney will also be a good accompaniment. As with most dishes, its taken to a new level if topped with a blob of fresh and soft home made butter! This dish, (minus the butter topping!) 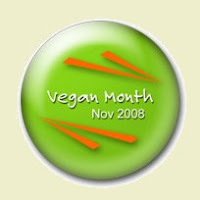 goes to the Challenge at Veda's blog - Iyengar's Kitchen! We have begun receiving posts for The Kitchen Treasure Hunt event, and from the looks of it we will be seeing some very interesting posts! Here is what we have received from a participant. 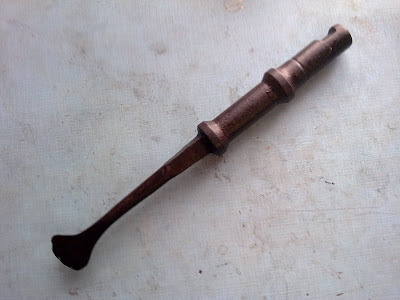 Can you guess what it is and where it is from? I am not saying who sent it, as that could give away the answer! Post your guesses in the comments section below! We will reveal the answer during the round up! This is yet another dish which has to be spelt with a 'ZH' syllable. Many words of Tamizh (Tamil), when written in English are forced to use the syllable 'ZH', for want of a closer match to the pronunciation. 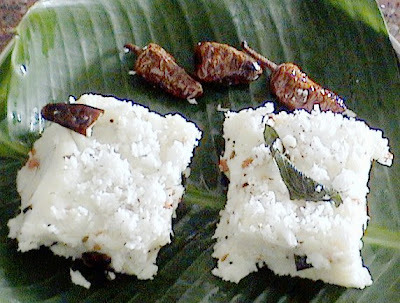 Kozhambu, Kozhal Puttu, Vazhapazham… the list goes on. My fourteen year old grandson has a flair for languages. He wondered how readers could correctly pronounce the names of the dishes which had a 'ZH' in the spelling. He has made the notes given below for convenience and correct pronunciation! The 'Z' or 'ZH' in the word is called as a PALATAL AND RETROFLEX consonant. To pronounce 'ZH' , the sound 'AA' is made after rolling the tongue backward (retroflex) and by pushing the tongue against the upper palate (palatal). We had great fun when we tried to say ‘ZH’ without rolling the tongue backwards which resulted in just an ‘AA’ sound, rather than ‘ZH’! I am happy to write this note as it has been ‘tested and tried’ by us to everybody’s amusement and intrigue at home! Now coming to MOR KOOZHU (say 'u' using a palatal retroflex!! ), it is one of the very easy and quick recipes using rice flour as the main ingredient. My great grandmother who lived up to her 96th year enjoyed the dish, and it was often for tiffin at home. The gingili (sesame) oil used in the recipe is non-carcinogenic. It has a very good nutritional value, enhances HDL (good cholesterol) as well as has the property of reducing the LDL (bad cholesterol). Gingili oil has a very important place in AYURVEDA (the Indian medical science). Gingili seeds and the oil extracted from it have been in use since 2000 years. Fresh gingili oil has the colour of honey and has a very pleasant aroma. The name ‘NALLA ENNAI’ in Tamil means ‘Good Oil’. 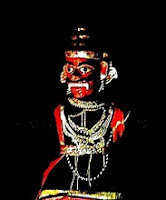 Hence gingili oil can be used without any hesitation or reservation. 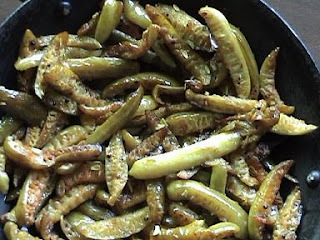 'MOR MILAGAI' used in the recipe are readily available green chillies, that are soaked in spiced curd, and then sun dried. These sun dried chillies are usually fried until crisp and used as a side dish. Indian Stores should stock this. 1. Mix salt, curd and rice flour, adding water to make a batter which is little more watery than the normal dosa batter consistency. 2. Heat oil in a kadai and add mustard seeds and asafoetida. 3. When the mustard splutters add the dals and roast till golden in colour. 4. Break and add the red chillies and the mor milagai. 5. When the chillies become crisp add the curry leaves. 6. Now add the curd and rice flour batter and keep stirring. 7. Continue stirring to avoid lumps till it becomes a thick ball and leaves the sides of the kadai. 8. Spread the Mor Koozhu on a deep plate, and sprinkle the freshly grated coconut on it. 9. Cut into Cubes or any other desired shape and savour with fried mor milagais. This post goes to Srivalli's Rice Mela at Cooking 4 All Seasons blog. 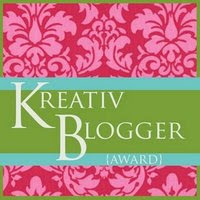 This post goes to the POM Wonderful Content hosted by Jenn of the The Foodie Blogroll (weekly give away) and POM Wonderful ($5000). Here is a simple recipe that contains two very delightful ingredients. 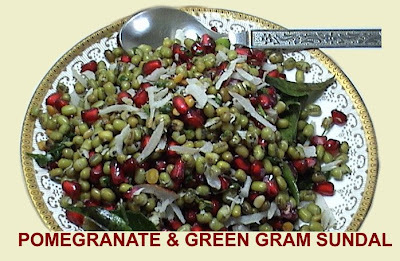 Combining freshly sprouted green gram, and the ruby red pomegranate, make this dish not only a powerhouse of nutritional benefits, but also entices with visual appeal, and a lovely taste. 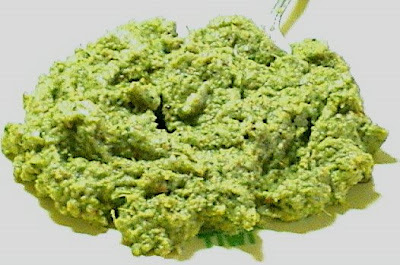 Whole green gram or payaru is used in the preparation of Sundal for various occasions. Sundal can be called a cooked salad, mainly prepared out of soaked or sprouted whole lentils. 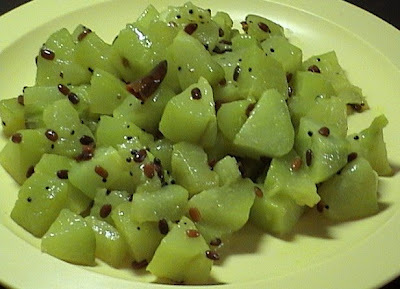 South Indian Meals prepared during weddings and other festivals always include two varieties of Sundals or Kosumaris. 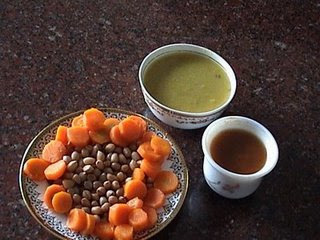 Kosumaris are similarly made of soaked lentils, but are not usually cooked. Many caterers are innovative and they introduce variations in the traditional dishes which are appreciated by the connoisseurs. One such innovative dish that I tasted at a thread ceremony is Madulam (Pomegranate) Pachai Payaru (green gram) Sundal. It was a real treat to the eyes and palate. 1. 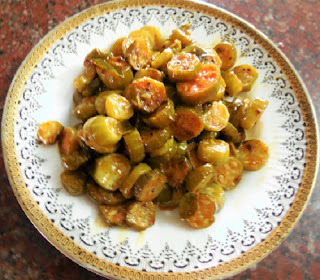 Prepare by soaking the whole green gram over night, or for 12- 14 hours. 2. Wash and drain the green gram, and cook it in 2 cups of water to make it soft. Don’t overcook it, as it spoils the texture and taste, and also destroys the nutrients! If you use more water its okay. 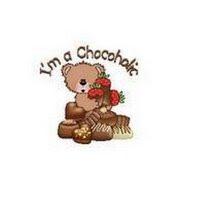 However, I avoid it, as I don't like to drain the grains and throw away all the nutrients along with excess water! 3. Heat oil in a pan. Add asafoetida and mustard seeds. 4. When the mustard splutters, add chopped green chillies, curry leaves and turmeric powder. 5. Next add the cooked green gram and salt and sauté for a minute. 6. Add lime juice and the coconut slivers and blend. 8. When the Sundal becomes cool mix in the red pomegranate seeds. This delicious and colorful sundal can be relished as a side dish , or as snack by itself. This yummy vegan sundal also goes to Vegan Ventures, Round 2, at Suganya's Tasty Palettes blog. Those were the days when I never managed to get a hole in my vadai!! Since my family loved Thair Vadais, I prepared them quite often, but with the distinctive holes missing! However, it was compensated by the coarse chilly, coconut and ginger paste, green coriander dressing, and the spicy seasoning in a thick curd base. As my babies grew up and were ready to taste Thair Vadais, I started making them with minimum spice and a smooth curd base. This became a hit with the rest of the family members as well, since then my thair vadais on popular demand remain the same - without holes, and without the heavy masala paste. These blobs in smooth curd, can easily be mistaken for some nice desert or sweet! I still remember the surprised look on the face of my daughters’ music teacher when he had the first bite of my Thair Vadai, expecting it be a sweet. But he did enjoy it after all and even requested for a second piece. 1. Soak the dal for half an hour. 2. Grind into a smooth batter adding little water at a time, along with ginger and 1/2tsp of salt, and leave it aside. The batter can be of idli batter consistency (this is more thin than what is traditionally made for vadais, but gives spongy vadais). 3. Add 1/2 tsp of salt and sugar to the thick curd and beat well to a smooth paste, without any lumps. 4. Take 2 tbsps of this curd and dilute it with 2 glasses of water, and keep the rest aside. 5. Heat oil and drop one spoon of batter into it and fry into a golden brown vadai. Six to eight vadais can be fried at a time. 6. Drain the first batch of vadais, and immediately immerse them in the watery curd, prepared in step 4. 7. Now start frying the next batch. 8. 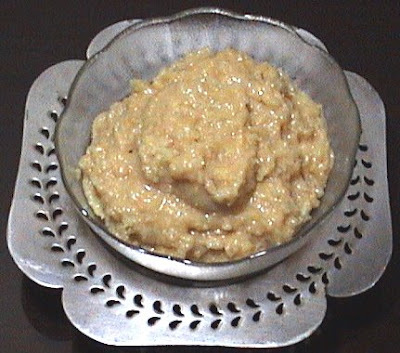 Remove the first batch of vadais, which have now bloated, by absorbing the diluted curd, and arrange them in a shallow dish. This creates space for immersing the second batch of vadais. 9. Arrange all the fried and soaked vadais in the shallow dish. 10. Mix in the carrot gratings and chopped coriander into the thick curd that was set aside. 11. Sprinkle the chilly powder, cumin powder and coriander powder on top of the curd. Don't mix yet. 12. Heat 2 tsps of oil and add mustard seeds and cumin seeds. 13. When the seasoning splutters, pour it all over the spice powders on the curd cooking them. You can now mix well. 14. Now pour the seasoned curd mixture covering all over the vadais. Enjoy these spongy luscious Thair Vadais with loved ones.